McMullen County’s boys basketball team beat Austwell-Tivoli 76-21 at home on Feb. 5 for its 11th straight win and second straight 20-win season. Cayden Turner scored 22 points and hit six of the teams nine three-pointers. The Cowboys (20-7, 7-0 District 1A-32) will have several days to prepare for their regular-season finale on Feb. 12 at 5 p.m. at Nordheim, in which they will play for the district title. 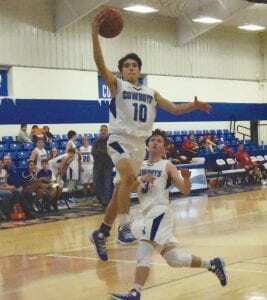 The Cowboys had won their first game against Nordheim 41-39 on Jan. 24. On Feb. 1, McMullen County beat Bruni 75-25. The Cowboys led 21-9 after the first quarter and 39-11 at halftime. Colton McCartney scored 19 points. Troy Allen added 12 points. Logan Ridgeway had 10 points.